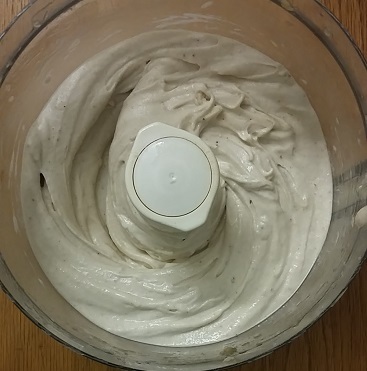 Banana ice cream – cheap, easy and tastes great. Big tick. Wow. It’s been crazy busy, head down, hard working, ‘what happened to lunch?’ kind of week. One reason for the whirlwind was that I was writing an article about investing for the Money section in this weekend’s Sunday Times, so it will be exciting to see it printed in the paper tomorrow. But in the mean time, here’s a round up of the frugal things I managed to fit in. 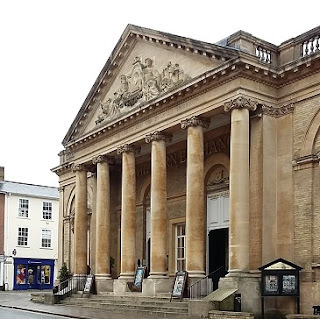 Last weekend, my husband took my son to play in a mini rugby festival over at Bury St Edmunds, so my daughter and I went along for a day out. As it was grey and raining, Isabel and I headed for the cinema. We chose a “Movies for Juniors” early morning showing of “Ice Age: Collision Course”, and with an extra 10% discount for booking online via a “My Cineworld Plus” account, the tickets for two cost a bargain £3.60. I managed to steer clear of the pricey cinema snacks in favour of four Wispas for a pound from a nearby Co-op, and we took a packed lunch for later. Afterwards we stopped in a local park while the sun was shining, and then headed on to the Abbeycroft Leisure Centre. We’d never been there before, but Isabel loves swimming, so we paid £8.40 for the ominously named “Wet n Wild” session. Turned out to involve multiple swimming pools, with shedloads of floats and balls in one, a full on pirate ship in another, a slightly chilly jacuzzi and two huge and quite terrifying flumes. I passed on the flumes (coward), but Isabel was overjoyed. In better weather we’d have spent more time in the beautiful Abbey Gardens, but for a day of indoor activities £13 for the two of us didn’t seem bad. Confession time: I was sceptical when a friend swore blind that ice cream made from frozen banana tasted great. But I gave it a whirl, and boy was she right (Hi Sharon!). It is so easy, and the kids were really keen to get involved. 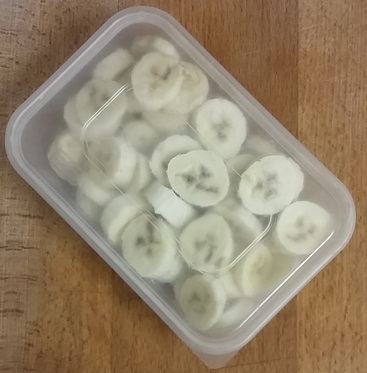 Top tip: peel the bananas and cut into circles BEFORE freezing them. Then get them out of the freezer for a few minutes so they’re not rock hard, whizz with a food processor or stick blender till it looks like Mr Whippy (hang on in there, it takes longer than you might expect). Then refreeze the mix in a tub or moulds. Or just scoff a bowlful that wouldn’t fit. I used three yellow-stickered bananas, and the teddy bear lolly moulds I found in a charity shop last year, so it cost all of 15p for six lollies and an extra helping. My son has got all keen on chopping up bananas and shoving them in the freezer to make more. So far we’ve just tried plain banana, but you could chuck in anything else you fancy, from frozen berries to chocolate chips. If you search on Pinterest for banana ice cream or banana nice cream, there’s a mind boggling array of flavours, but I’ve pinned a couple to my board. Free mug – cheers Adnams and St Elizabeth Hospice! I was delighted this week when a parcel showed up from Adnams, the Suffolk brewers based in Southwold. Over the summer, we did a couple of family trips to Ipswich to follow the Pigs Gone Wild trail in aid of St Elizabeth Hospice. Loads of local businesses sponsored and decorated models of pigs, named them with painful puns (Ed Sheerham, Frankenswine and Elvis Porksley were particular favourites) and set them up as a sculpture trail round the city centre. Each pig had a QR code you could scan using an app on your smartphone, and most of them had competitions to enter. I cheerfully entered as many competitions as possible, figuring not too many other people would. 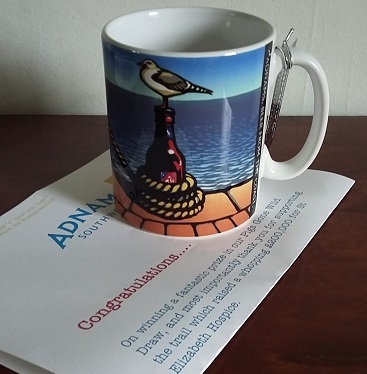 Good plan – I ended up winning a very smart seagull mug courtesy of Sir Bradley Piggins. It’s now stashed in my present cupboard waiting for Christmas (relatives look away now) but I like it so much it might end up sneaking its way into our kitchen. Ever seen those vouchers for money off Gousto food delivery boxes? I’ve stashed away several in the past, but this week I finally grabbed the chance to try a discounted delivery box. With a crazy busy week, I was worried I wouldn’t have time to cook, and we’d end up fed up with fishfingers or ordering expensive takeaways. During my October savings challenge I really wasn’t keen on the idea of splashing extra cash for dinner, or letting the contents of the fridge turn into sludge! With recipe boxes from the likes of Gousto, you get to choose from a selection of meals, and then a box shows up crammed with fresh food, all measured out to make the recipes. It means you can cook from scratch without the faff of meal planning, shopping and forgetting vital ingredients. 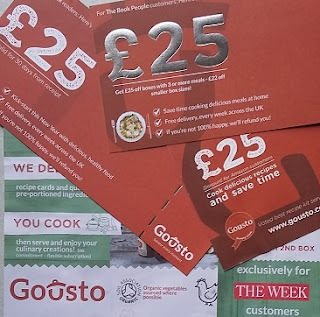 Anyway, I’ll be writing a proper post about Gousto, but it’s been such a relief to have this week’s evening meals sorted. We’ve had huge fun cooking them, and even more fun eating them. 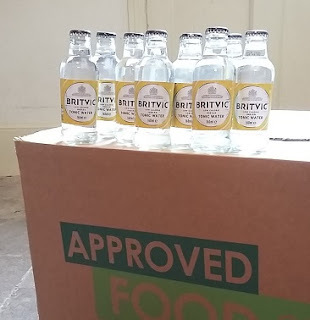 Handy for International Gin & Tonic Day. Yes, that is a thing. And talking of the October savings challenge, I am still staggering on with small daily changes to spend less, earn more and save a chunk of cash towards Christmas – I just haven’t had much chance to blog about them! I posted this week about Day 11: Chasing Money Owed, and I’m glad to say the £70 invoice I finally sent has already been paid. Many cheers. So there are lots more things I’d like to write about! Just a small matter of half term this week. Anyone else have any money-saving measures to report? Inspiration for thrifty activities to survive half term? I’d love to hear! Definitely worth trying the banana ice cream, surprisingly good. Banana icecream is a real favourite of mine. Just don't put them in the fridge with the skins on as I did the first time I made it …. you have to slice the skin off bit by bit, what a faff. Now any banana we have that's going a bit too ripe to eat gets quickly sliced and chucked in a tub in the freezer ready for either icecream or Nutriblasts. Banana ice-cream is the beeeeeest! I love it I love it I love it. It was a massive revelation when I first discovered it, especially because it's so good from a food waste perspective. 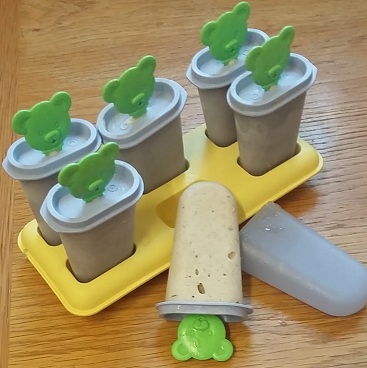 The riper the banana, the better the "Nice-Cream" – so all those manky brown bananas are given a new lease of life! Aaaaaaaand on the topic of Approved Food & things like that, there is also now Love Health Hate Waste! I am an affiliate, I think it's great. Up to 90% off health foods and household items that are past their BBD. Yay! Ooooh interesting about Love Health Hate Waste. I knew Approved Food could be good for gluten-free specialist lines, hadn't realised there was a health food equivalent. We love banana ice cream too – we add cocoa powder to make chocolate banana icecream and quite often a bit of milk too as it makes it sweeter! Love Food Hate Waste sounds interesting Lorna – I'm off to check that out now!